Recent major tailings dam failures have led to an industry-wide review of the design and management of tailings storage facilities. Before the 1960s, mine tailings were often disposed directly into ponds, lakes, rivers or natural topographic depressions, or stored in impoundments supported by earthen dams, without necessarily applying engineering principles (McLeod et al. 2015). The proper application of engineering design to tailings dams started in the 1960s by using the principles of conventional water dams and soil mechanics. 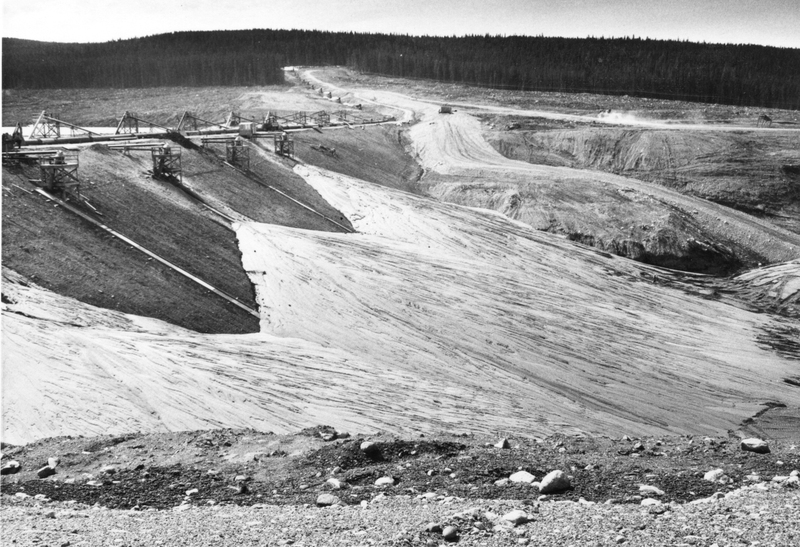 In the 1960s, Earle Klohn, one of the founders of Klohn Crippen Berger (KCB), recognized that applying water dam technologies to the design of large tailings dams for the new high-tonnage copper mines in British Columbia, Canada, was problematic, because tailings dams are continuously constructed (raised and expanded) during the life of a mine, whereas water dams are built once and rarely change. Tailings dams also differ from water dams because they impound a mix of saturated tailings solids and water, rather than only water. In response, Klohn pioneered the design of centreline cyclone sand dams, one of the first engineered tailings dam designs in the world (McLeod et al. 2015). Today, Klohn’s design continues to stand the test of time by meeting modern seismic criteria for tailings dams. There are three main types of tailings dams: upstream, downstream and centreline. Upstream tailings dams are built progressively “upstream” of the starter dam by incorporating tailings materials into the dam for support, through the “controlled” deposition, or “spigotting” of tailings. Figure 1 shows an historic example of temporary boards being placed to contain the spigotted tailings as a tailings dam is progressively raised, and Figure 2 shows a schematic cross-section of the commonly-used upstream tailings dam. While using tailings materials to build the dam reduces construction costs, upstream tailings dams may be less stable than other designs under static loading and in the event of an earthquake (i.e. under dynamic loading), because tailings materials may liquefy and lose their strength (McLeod and Bjelkevik 2017). In some seismically-active countries, such as Chile, upstream tailings dams are not permitted (Tailings.info). Upstream tailings dams have been built for over a hundred years, and their design has evolved with improved construction practices and a better understanding of the potential for the static and dynamic liquefaction of tailings materials. They are best suited for arid climates where less water is stored in the impoundment, and in aseismic regions. Downstream tailings dams are raised progressively “downstream” of the starter dam, with an internal drain or filter. They often have an impervious layer (low permeability zone) on the upstream slope of the dam (labelled “core” in Figure 3). Downstream tailings dams do not require support from the tailings placed against the core, however tailings placed upstream of the core reduces the hydraulic gradient through the core zone. Figure 3 shows a schematic cross-section of a downstream tailings dam. Downstream tailings dams require more material to build than upstream tailings dams, but are considered more stable than upstream dams in the event of an earthquake. Centreline tailings dams are raised progressively while maintaining the original centreline of the starter dam. They usually have an impervious core, which is supported by a localized zone of compacted tailings, and an internal drain or filter (Figure 4). Like downstream dams, the use of cyclone sand tailings upstream of the core reduces hydraulic gradients through the core zone (McLeod and Bjelkevik 2017). Cyclone sand tailings consist of the coarse fraction of tailings materials. Centreline tailings dams require less material to build than downstream tailings dams, and are more stable than upstream dams in the event of an earthquake. Figure 5 shows cyclone sand tailings discharged downstream of the starter dam crest at the Gibraltar Mine, and Figure 6 shows a cyclone sand dam at the Brenda mine, both in British Columbia (McLeod 2016). Based on lessons learned from the investigations of the recent Mount Polley and Fundão tailings dam failures in British Columbia, Canada and Minas Gerais, Brazil respectively, government agencies, regulatory bodies and industry are improving how tailings dams are designed, built and maintained. Improvements stem from recognizing that it is not business as usual for the mining industry, that design principles must be properly applied to tailings dams, that one design does not fit all scenarios, and that tailings dam designers must adopt the latest best practice guidelines and technologies. With KCB’s help, British Columbia recently revised its Health, Safety and Reclamation Code for Mines in B.C. KCB’s Harvey McLeod, P.Eng., P.Geo., Principal and Vice President, Strategic Marketing, chaired the Tailings Technical Review sub-committee, tasked with incorporating recommendations from the Independent Expert Engineering Panel’s investigation into the Mount Polley tailings dam breach in August 2014. The sub-committee included representatives from regulators, dam owners, First Nations, and consultants, along with input from the public. Now enforceable by law, the revised mining code lays out clear regulations for the safe management of tailings dams, including revised design requirements for engineers, and revised operational and management requirements for mine owners. The code is designed to protect the public and the environment from activities throughout the lifecycle of a mine operating in B.C. In tandem with B.C.’s new mining code, the Association of Professional Engineers and Geoscientists of British Columbia (APEGBC), with input from KCB and other stakeholders, published their practice guideline Site Characterization for Dam Foundations in B.C. in 2016, to improve the state of practice of tailings engineering. The Canadian Dam Association (CDA) and the International Commission on Large Dams (ICOLD), representing the Canadian and global scientific community and industry respectively, are also revising their state of practice guidelines. The ICOLD bulletin on Tailings Dam Technology Updates is scheduled for publication in 2018. Similarly, the Geoprofessional Business Association (GBA) is developing their National Practice Guideline for the Tailings Storage Facility Engineer of Record, for publication in October 2017. KCB’s senior engineers have extensive knowledge and experience of best practices in tailings dam design. Harvey McLeod has been involved with both the CDA and APEGBC to incorporate lessons learned from Mount Polley into practice, and to improve guidelines and regulations for tailings dams. In addition, KCB’s Chairman, Bryan Watts, P.Eng., was part of the forensic investigation teams for the Omai, Los Frailes, Mount Polley and Fundão tailings dam failures. McLeod et al. (2015) report that despite recent tailings dam failures, designs continue to improve as engineers apply principles from other engineering and environmental disciplines, while avoiding the misapplication of water dam technologies to tailings dams. For example, the practice of placing rockfill next to a core zone is common for water dams, to support the core zone when the reservoir water level is drawn down, but it is not suitable for tailings dams because (1) water (or impoundment) levels in tailings dams cannot usually be drawn down, and (2) the rockfill may lead to high hydraulic gradients through the core zone (Figure 7). Tailings dam design should be based on a complete understanding of the foundation geology and soils, through comprehensive site investigations, and designed for the full life cycle of the mine, from the initial stages of construction, to mining operations, and ultimately decommissioning and closure (McLeod and Bjelkevik 2017). There is no “one size fits all” design solution for tailings dams. Each tailings dam is unique because of the variety of mine site conditions, including the climate and topography, the physical and geochemical properties of the ore and tailings, the amount of water, the impact on water quality, the planned height of the dam and the available construction materials (McLeod 2016). Tailings dam designs must also include long-term closure plans and minimize risks to the physical, geochemical and ecological stability of the tailings facility (McLeod and Bjelkevik 2017). Dam slope failure due to the inadequate characterization of foundations or quality control and assurance of construction fill. Piping failure due to the inadequate design or quality control and assurance of filters. Overtopping failure due to the inadequate management of water in the tailings storage facility. Minimizing water held in the tailings storage facility, while balancing the need to saturate acid-generating tailings when present. Thickening or filtering tailings materials (see below). Widening the dam crest to prevent “slumping” or erosion from minor dam breaches. Placing cyclone sand upstream and downstream of the core zone to act as a natural filter and to infill natural voids and cracks in the impervious core. Adding redundant spillways in non-critical areas of the impoundment to manage excess water. Reclaiming the site at mine closure with vegetation and erosion-resistant surfaces. With advances in site investigation techniques such as cone penetrometer testing (CPT), 3D geophysical surveys, LiDAR and satellite imagery, and modeling techniques using sophisticated software, the engineers’ design toolkit for tailings dams is rapidly expanding. Of all the available technologies, McLeod et al. (2015) assert that the process of thickening or filtering tailings will play a significant role in tailings dam design for years to come. One way to reduce the height of tailings dams (some are more than 300 m high), and to recover water impounded by tailings storage facilities, is to dewater the tailings to create thickened or filtered tailings. Tailings are thickened into a paste by removing excess water and recycling the water back into the mine processing stream via holding ponds. First adopted in the 1980s, and following Earle Klohn’s prescient address to the University of Missouri in 1977 on the advantages of producing “dry” tailings (McLeod et al. 2015), the process of thickening tailings was capital-intensive and expensive. Today, with improvements in filtering equipment and thickeners, the process is now becoming cost-effective (McLeod 2017). While thickening tailings reduces the risk of a catastrophic tailings dam failure, it does not eliminate the risk of failure altogether, nor the requirement for other technologies, such as geomembrane liners and water treatment, to meet environmental regulations. Thickened tailings are saturated and may have the potential to liquefy under certain conditions, so they need to be compacted and continuously monitored for liquefaction potential. Furthermore, the process of thickening or filtering tailings requires a larger footprint for mechanical equipment, which may be challenging or impractical at mine sites in mountainous areas. The design of tailings dams requires qualified and experienced professionals who investigate and understand the site-specific conditions, and apply the proper technologies using risk-based thinking to develop safe and sustainable tailings storage facilities. Ask us how we can help you with your tailings management needs. McLeod, H. and A. Bjelkevik. 2017. “Tailings Dam Design: Technology Update (ICOLD Bulletin),” in Proceedings of the 85th Annual Meeting of International Commission on Large Dams, July 3-7, 2017. Prague, Czech Republic: Czech National Committee on Large Dams. McLeod, H.N. 2016. “History of Tailings Dam Design, Innovation, and Practice Changes Required in the Wake of the Mount Polley Mine Tailings Breach,” in: GeoVancouver, History and Innovation, 69th Canadian Geotechnical Conference, Vancouver, British Columbia, October 2-5, 2016. Toronto: Canadian Geotechnical Society. McLeod, H.N., B.D. Watts and H. Plewes. 2015. “Best Practices in Tailings Dam Design“. CIM 2015 Convention, Montreal, Canada. Read more about the use of geomembrane liners here. McLeod, H.N. and L.M. Murray. 2003. “Tailings Dam Versus a Water Dam, What is the Design Difference?” ICOLD Symposium on Major Challenges in Tailings Dams. June 15, 2003.